The impact of fluorescence on the value of diamonds? For a while now, there is a lot of talk in professional circles related to diamonds about the influence of the fluorescence of these gems on their value. Therefore, we wanted to comment briefly on some points in this regard based on the recommendations made by the well-known Rapaport Magazine, one of the references in diamond pricing. In the first place, the influence on the price of a diamond depends on its intensity and, therefore, on its visibility, that is, whether it is easily appreciated or not. In any case, keep in mind that in some (not all) diamonds of very good color the fluorescence produces a milky effect that diminishes its value. But other times the fluorescence does not produce any appreciable effect on the appearance of the gem. 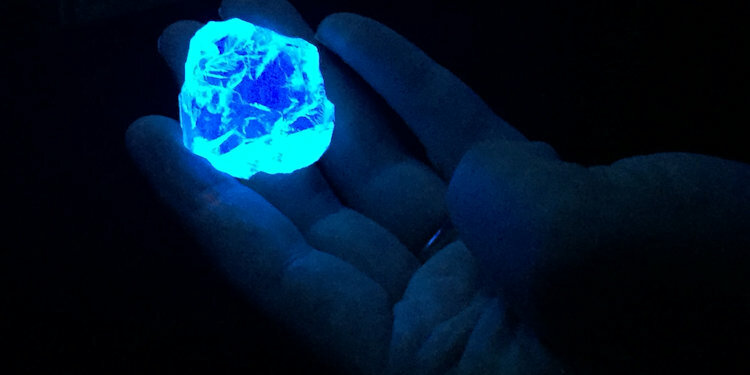 However, blue fluorescence sometimes produces a beneficial effect on some qualities of diamonds; in particular, it adds value to the lower color qualities, for example, “J” or lower. This is because the yellowish tones combine with the blue fluorescence and, in this way, the gem looks whiter. In these cases, blue fluorescence can increase the value of the diamond. The most controversial point is the penalty on the price that sometimes applies to diamonds that show yellow or white fluorescence. Sometimes these gems are applied up to a discount of 5% on the value they would have if they did not have said fluorescence. In addition, in addition, the better the color of these diamonds, the more the discount on the price of the gem is reflected. However, we must bear in mind that the fluorescence of diamonds is analyzed with ultraviolet lamps of certain wavelengths. In particular, long wave ultraviolet light at 366 nm and short wavelength ultraviolet light at 254 nm. And, therefore, sunlight that is between 700 nm and 400 nm approximately, may or may not stimulate the phenomenon of fluorescence in diamonds that do present with ultraviolet. Fluorescence is the reaction of some minerals that have degrees of luminescence (emit light) when exposed to ultraviolet (UV) light. 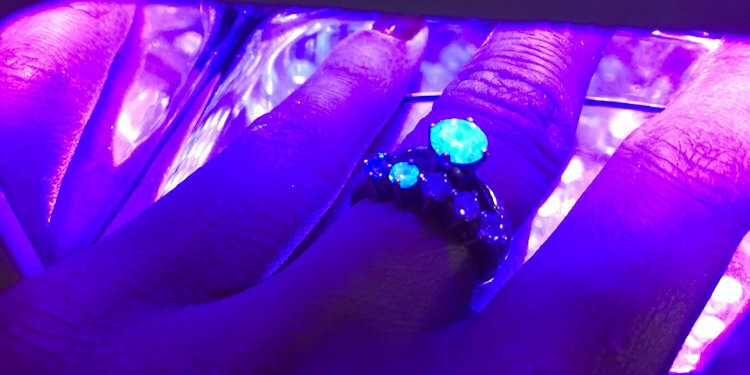 In the case of diamonds, this reaction is caused by the presence of trace elements in their chemical composition and about 25% to 35% of the diamonds on the market exhibit fluorescence when exposed to UV light. Generally, diamonds emit luminescence in bluish (more frequent), yellow (less frequent) or orange (rarer). Bluish-coloured fluorescence may make the diamond yellowish (GIA-I “M” grading) appear more colorless when exposed to UV light or natural light (sun). For example, a diamond having a blue (medium to very strong) fluorescence and a “J” color gradation appears to have an “H” color gradation when viewed in the sunlight. In contrast, a diamond that has yellow fluorescence exhibits a more yellowish color when observed in the sunlight, thus decreasing its color gradation. When the diamond exhibits a very strong intensity blue fluorescence, this characteristic causes a greater interference in its color gradation. In this case, a negative value is expected due to the “stigma” created by the market, and a discount range of up to 15% is offered on diamonds with this feature, although large discounts are rare. Diamonds of “D” and “H” color gradations that exhibit blue fluorescence are considered less desirable in the market. Some practitioners believe that very strong blue fluorescence causes a blurry or oily appearance in diamonds, however, studies conducted in 1997 by the Gemological Institute of America indicate that people with ordinary visual acuity (and no scientific training for such analysis) cannot perceive this interference with the diamond’s appearance. On the other hand, Michael agrees that blue fluorescence generally interferes with the color grading of the diamond and gives advice to buyers: if you are buying a diamond with an “H” or lower color gradation, look for a diamond with medium intensity blue fluorescence. We are hesitant to suggest that you look for a diamond with strong blue fluorescence, knowing that even in the lower color gradations there is a possibility that the diamond may have a milky or blurry appearance. However, the lower the color gradation, the lower the likelihood of the diamond presenting a milky appearance. The following table indicates the devaluation in the price of diamonds with intense blue fluorescence.